More of the Howards Storage World Garage Makeover - Out With The Stink! 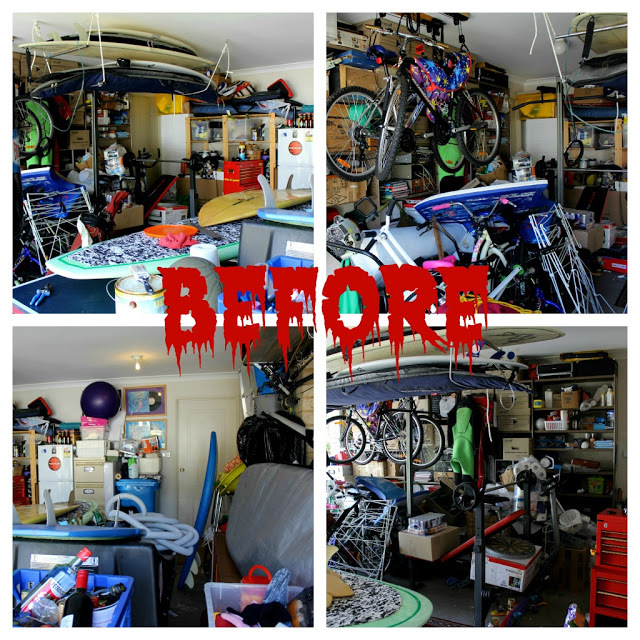 | Life Love and Hiccups: More of the Howards Storage World Garage Makeover - Out With The Stink! More of the Howards Storage World Garage Makeover - Out With The Stink! Well hellooooo and Happy Friday. I don't know about you but I am sighing in relief at seeing the end of this week. With all the emotion of kids returning to school and my baby starting out on his schooling journey, I'm a little drained and ready for a cocktail or 3. 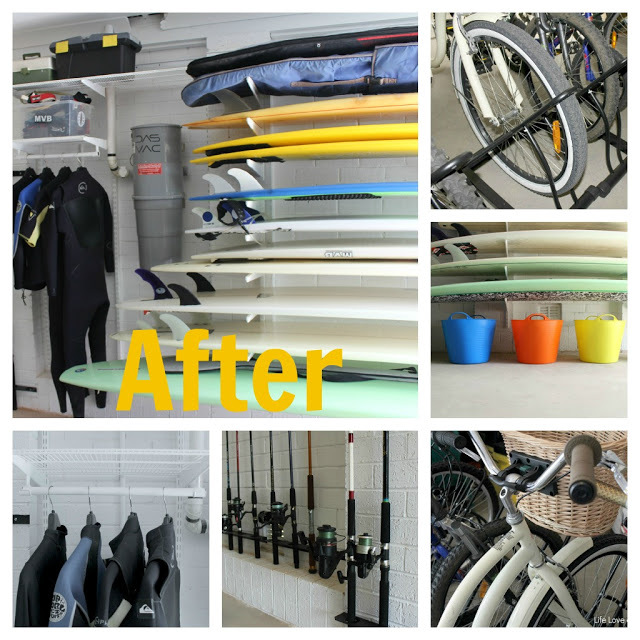 We have been making great waves on the Garage Makeover with Howards Storage World and we are now at the finishing touches stage. I have to tell you it was a dream in the school holidays to be able to go to the garage and find what we wanted when we wanted it. Um let's not rush these things shall we. So another section of our garage that needed some help was the back wall in the picture below. What! There is so a wall in there, its just that it is slightly camouflaged by all the paraphernalia (aka crap!). Ok so the thing is that despite all the clean out and chuck sessions we have conducted over the past 2 months, we still have a lot of stuff to store in this garage. That is life and as much as I dream about one of those garages with all bare walls and nothing but one small cupboard to store things in, the reality is - it aint gonna happen. Not in this house anyway. We had to find a solution to neatly store all the things we just cant get rid of, which is actually quite a lot of stuff. I like to renovate and decorate so there is lots of equipment that I need to store for that and my hubby has this thing going on with my Dad which is He who dies with the most toys wins!! Needless to say that because of this, we have a lot of tools and gadgets that I don't even know the names of that needed a storage solution. Enter the elfa System again. 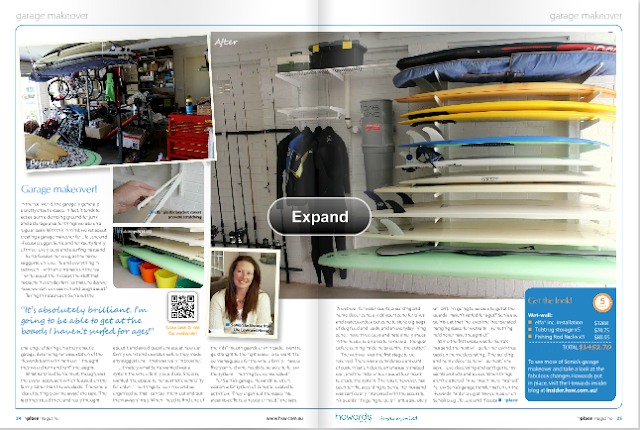 You may remember this fabulous elfa racking system which we used in the Water Sports Zone to hold all our surfboards. This time we used more of the shelving racks to hold the many boxes we needed to store up and off the floor. The brief was we also wanted a bit of a work bench, kind of a hobby area, and once again the Howards Storage team came up with a plan that works for us now, but can be modified at any time should our needs change. Flexible storage solutions - perfect for a person that changes her mind every 5 minutes ..... that would be me! The layout plans were drawn up to accommodate things that we couldn't move off that wall - like the fridge, shredding bin and tool bin. But as I mentioned before, we can change it up at anytime if we feel like it. The other thing that was high on my list, actually it was the thing scrawled all over my list in big BOLD writing. 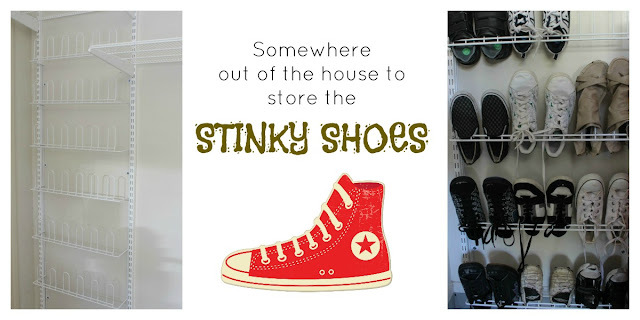 I wanted somewhere to store all the Kid's stinky shoes so they do not have to even come in the house. I'm sorry, I adore my children but their insistence at not wearing socks with their sneakers means their feet stink and their shoes have a rather rank aroma to them that no amount of Glen 20 can kill!. A white 21 pair Shoe Rack was installed on the wall next to the doorway that the kids use to go in and out of the house. With a bit of training and a bit of bribery they had it down pat. You wanna come in the house? You take your shoes off and put them on the rack! So we are nearly there. One more wall to go and we are in Garage Paradise baby. It has actually been quite painless so far I really do not know why we insisted on living with that festering pit of shame for so long. Here's a reminder of how far we have come. I can't wait to show you the final wall and then the big reveal. 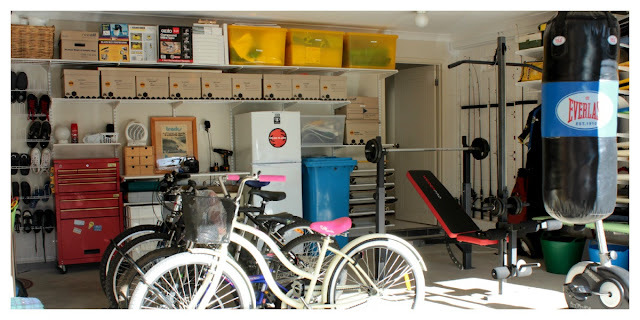 By the way, our Garage Makeover was featured in the Howards Storage World In Place Magazine. You can grab a copy in store or you can check it out online here. 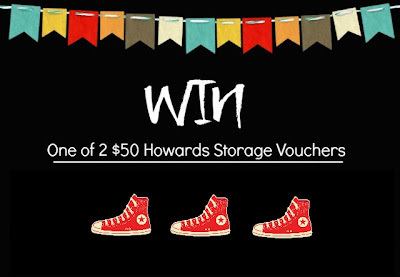 Once again the lovely people at Howards Storage want to give you guys the chance to get organised so there are 2 more $50 vouchers up for grabs. How To Enter: Like the Howards Storage World Facebook Page here and leave me a comment here on this post telling me how a HSW voucher could help you need to get organised in your home. This competition is open to Australian residents only sorry. It is a game of skill and the judges decision is final. The competition is open now and closes Friday 22/02/13 at 7pm. The winners will be notified by email and will also be announced here on this post . The winner will have 5 days to claim their prize. In the event they do not contact me in time, a new winner will be selected. So tell me - what needs sorting in your home? And once he was there he started to roam. And together they captured our family study. Fast became our dumping ground. Now there’s hardly any space! It’ll become a project I can no longer ignore. Is a moment for which I constantly lust. And restore my life to better days! You guys have each one yourselves a $50 Howards Storage Voucher!